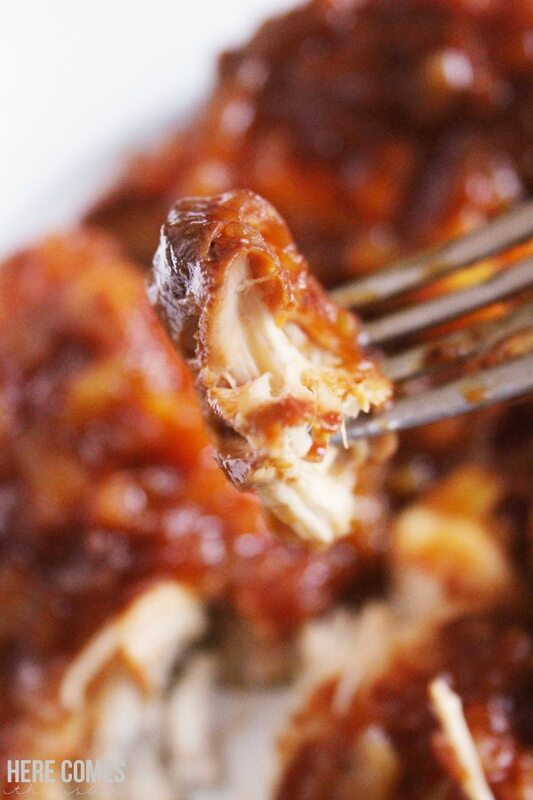 Inside: This slow cooker crockpot Hawaiian Chicken recipe has only 3 ingredients and is super easy to make. When it comes to making dinner, I LOVE to use my crockpot. With after-school activities ramping up again soon it is just so nice to know that dinner is ready to go and I don’t have to spend precious time in the kitchen during those after school hours. I have a Hamilton Beach Crock Pot and I love it! It is perfect for feeding a family of four and we always have leftovers when I make this crockpot Hawaiian chicken recipe so if you have a larger family it would work well too. We’ve got a slight break this winter with the activities but in the next month, we will be back to the crazy routine of soccer, Girl Scouts and running club. My son has also informed me that he wants to play t-ball, hockey, take karate AND organ lessons. Yes, ORGAN. I’m all about having well-rounded kids but something has got to give. I limit it to two activities at a time per child so he’s got some decisions to make. At least I don’t have to worry about dinner on those crazy busy nights when I make this Crock Pot Hawaiian Chicken recipe. Slow Cooker Liners – these are a lifesaver and make clean up a breeze! Slotted Spoon – there are many types of slotted spoons to choose from. I just recommend you get one that has slots small enough so the pineapple chunks do not fall through. You’ll want to use this spoon to drizzle the pineapple sauce over the chicken. Other than that, nothing else is needed to enjoy this Hawaiian chick crockpot recipe, except a crockpot and an empty stomach of course! Ready for some serious taste with only 3 ingredients? 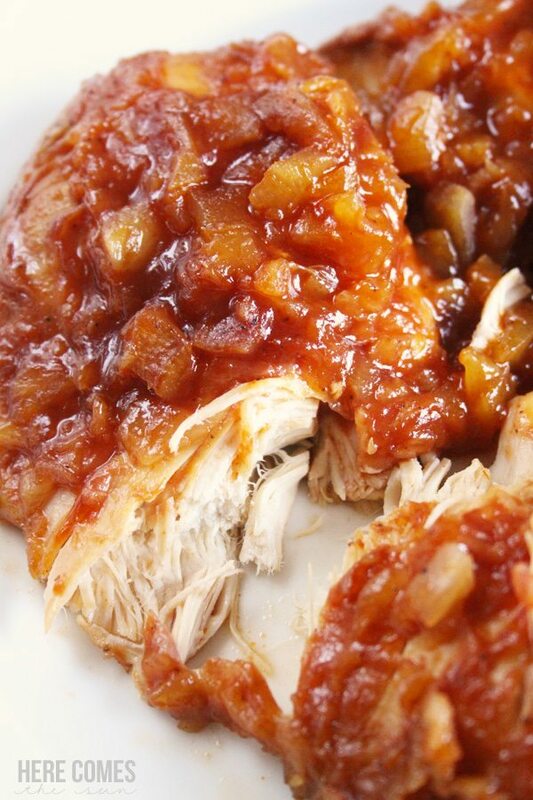 This crockpot Hawaiian chicken recipe is so versatile and is great for leftovers. You can serve this over rice but if you are trying to limit the amount of white rice in your diet, it also goes well with a side of green beans. If you have enough for leftovers the next day (and you may not because it is just THAT good), shred the crockpot Hawaiian chicken with a fork, pile it high on a bun and top it with coleslaw for a delicious twist on the typical BBQ sandwich. This recipe would be great for a party too! Make a big batch of it and place the crock pot out on the buffet so your guests can make their own sandwiches. Be sure to pin this to your Dinner Recipes or Crock Pot Board! Make sure to add this in your meal plan this week! Speaking of meal plans, have you ever tried freezer cooking? I’ve done it a few times and really like how easy it is to prep everything in one day and have meals ready to go for an entire week. 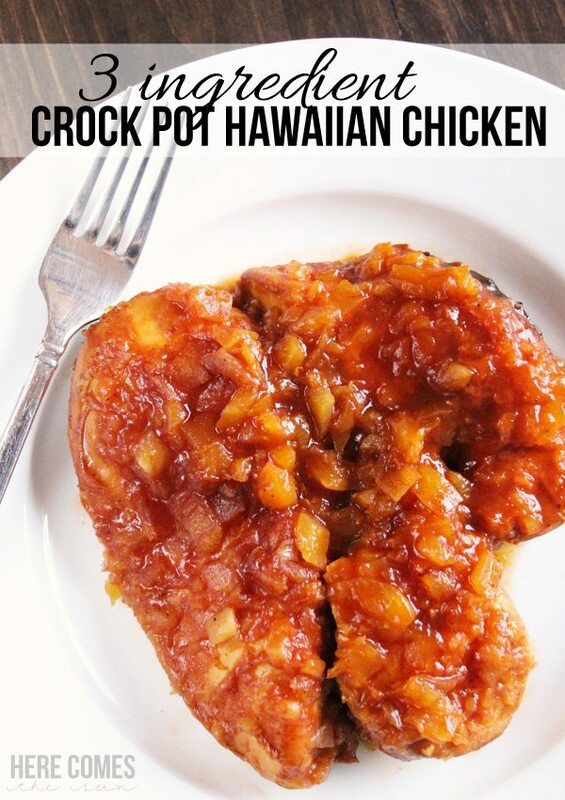 This crockpot Hawaiian Chicken recipe works really well as a freezer meal. I’ve recently discovered a service called Once a Month Meals that lets you build a custom menu from their database of over 600 recipes. After you build your menu, you then print out the menus, shopping lists, and prep instructions to create an entire month’s worth of meals in one day. Think of all the time you will save when you have an entire month’s worth of dinners ready to go! I’ve signed up with Once a Month Meals for this service in an effort to streamline my meal planning. If you want dinner time to be stress-free, I encourage you to check it out. I’ve been getting lots of comments/questions on this recipe. Here are some answers to the most commonly asked questions so you don’t have to scroll through all the comments! Q. My slow cooker Hawaiian chicken turned out soupy. How do I fix this? A. If the sauce is too thin for your liking, drain the pineapple before adding it to the crockpot. Q. Can I use fresh pineapple and not canned? Q. How many people does this Hawaiian chicken recipe feed? A. The recipe feeds 4 people. If feeding more people, adjust the recipe as needed. Q. Can I use frozen chicken breast? A. Yes. I have found that very thin frozen chicken breasts do not require any additional cooking time. Thicker frozen breasts will require more time. You should check your crockpot user manual for exactly how much time to add when using frozen chicken. Q. Can I use chicken thighs/quarters/wings etc. ? A. I have never used anything other than chicken breasts with this recipe. Other parts of the chicken will most likely work but you may have to alter the cooking time. Please check your crockpot user manual for cooking times. This sounds delicious and could be served for company. Do you drain the pineapple? Hi Nancy. It’s up to you whether you drain the pineapple. I’ve done it both ways but prefer to drain it so it doesn’t get too runny. Hi Jillian! I use Webers BBQ sauce. I would use 1/2 as much pineapple next time. A little too much for us. My hawaiian chicken came out really juicy and watery, how do i get it a “sticker” consistency? Hi Michelle! One way is to drain the pineapple. You could also add a bit of cornstarch at the end of cooking to thicken things up. I usually use a slotted spoon when removing the chicken from the crock pot. This makes it less soupy. I made this today, and by accident I didn’t realize that it called for an 8 oz can of drained pineapple and used a 20 oz drained can.. It was plenty thick enough without being runny at all. Very good! I drained mine but I guess not enough so I and a little flour worked perfect ? Thank you for recipe so easy and tasty. How many people with this serve. Cooking for 8, do I need to double the recipe? Thank you. Hi Molly! This recipe feeds four people. I am making this tonight and will be draining the pineapple. I am using Chunk Pineapple instead of the Crushed. I am also going to add pepper strips. I always change something in a recipe, just my way of cooking. i,m going to try tonight. sure looks good. Just wondering if I can freeze the barbque sauce? Hi Irene! Do you mean prepare it like a freezer meal? I think that would probably work although I have never tried it. I would recommend cooking it for a bit longer if you do it that way. Hope that helps. Hi Kelly, Yes, I was wondering if this could be a freezer meal. It’s so simple and looks so yummy! I’ll give it a try and let you know how it turns out. Thanks much. Hi Irene! I recently tried this as a freezer meal and it worked well. Make sure to use thin chicken breasts and you won’t have to add any additional cooking time. Pinnapple is acidic and works as a tenderizer. As long as it freezes quickly it should be OK but if pinnapple sits with chicken to long it will break it down and make it mushy. How long would you bake this in an oven and what heat would you use? I would bake it around 35-40 minutes at 300 degrees. I would check it at 35 minutes to see how well it is cooking and adjust from there if necessary. Hope this helps. Can you use frozen chicken breast for this, by chance? If you start with a frozen chicken breast, make sure that it is thin. If it is thin, you won’t have to add any extra cooking time. Can you use fresh pineapple? I try to stay away from canned products (due to BPA lining in the majority of brands). Yes. Fresh pineapple would work too. Can you use bone in chicken thighs? Hi Shelia. I’ve never tried it with chicken thighs but I don’t see why you couldn’t substitute them. I would just suggest cooking them 4-5 hours on low and removing the fatty skin from the thighs before cooking to prevent your meal from being too greasy. Can you use leg quarters? You can use any part of the chicken that you would like to. However, the dish may turn out greasier depending upon which part of the chicken that you use. Hi! Sounds great, but all I have is a can of pineapple chunks…would that work? Yes, pineapple chunks will work. I ended up shredding the chicken since it was so soft. This may be a stupid question, do you cook the chicken before putting it in the crock pot? Hi Rebecca. The chicken goes into the crockpot raw. Why did the sauce and pineapple not stick to the chicken? Hi Kelli. The sauce is not meant to stick. You just pour it over the chicken. I cooked it like the instructions, and it was not thick like the picture shows it was very soupy. Do you put it in the oven as well as crockpot? The basic recipe is good but I would add more to it because it’s kind of bland. Hi Susan. I do not put it in the oven. If the sauce is too thin for you, I would suggest draining the pineapple before adding it to the crock pot. mine was the same, I cooked it with the top off (lid) for the last hr, it did thicken, but not like the picture. I drained the pineapple before, and used less BBQ sauce too, from the notes people had left about it being thin sauce. Hi Amanda! If the sauce is too thin for your liking, you can use a slotted spoon when removing the sauce from the crock pot. Hope that helps. I cooking this now its a awesome idea and it made my house smell really good I put white rice applam making baked sweet potatoes and apples with cinnamon as a side . Do you shred the chicken before hand? No, I don’t shred the chicken before putting it in the crock pot. I sometimes shred it after it is cooked. This sounds so yummy! Do you think you could use pork instead of chicken? If so, what would you say cooking time would be? I’ve never tried this recipe with pork. As for cooking time, I would suggest taking the time is takes to cook pork in the oven and then modify that for a slow cooker. mine came out soupy as well I think the soupiness is due to the juices from the chicken coming out. is there any way to prevent that from making it soupy? Hi Linda! If yours is coming out soupy, I would try draining the pineapple before placing it into the crock pot. But you said you didn’t drain yours. Did you thicken it? I did not thicken mine or drain the pineapple juice. I have suggested draining the pineapple juice and/or thickening with cornstarch because some readers have said that their version turned out a bit soupy. I never thought about using it for quesadillas. That sounds so delicious! I just made this for my husband used Sweet Baby Rays Hawaiian Blend. He said it was delicious. What do u mean in a greases? I just got a crock pot as a gift nd trying to figure how to cook in it. Am I supposed to grease it or something before I put my ingredients in? Hi Brittany! I usually grease my crock pot with cooking spray, butter or margarine to make sure that whatever I’m cooking doesn’t stick to the crock pot. Could corn starch be used to thicken up the remaining sauce? I have never thickened this sauce with cornstarch but have used it in many other recipes to thicken sauces. So yes, I think it should work fine. You may also try draining the pineapple before putting it in the crock pot. What do you usually pair this with? Rice? Yes, rice is a perfect side for this dish. I mixed the ingredients in the crockpot. Will this affect how well or how quickly the chicken cooks? Thanks! It shouldn’t affect the cooking time at all. Has anyone made this as a sandwich? Thinking about making it for my husband and I.
Hi Kali! This would be great as a sandwich. I would suggest shredding the chicken and placing it on a hamburger bun. Another reader also commented that they used it for quesadillas. My family wanted theirs on a bin and I ate mine over rice. Both ways were delicious! I’m getting ready to make this myself, it sounds amazing! How many pounds was the chicken breast used for this recipe? Or did you use frozen? Hi Kourtney! I used 4 chicken breasts, approx. 1-2 lbs. I need to be careful of sugar and carbs. What barbecue sauce did you use without the extra fructose? I will use non-canned pineapple. Do you have other suggestions. Thanks. I used Weber BBQ Sauce. It has sugar in it but not high fructose corn syrup. Any type of veggie side dish would be great. Couscous would be good too. Made this yesterday. It was super easy and came out delicious!! I made this today and it looked just like yours and smelled delicious. Thanks for the easy recipe and everything you wrote couldn’t be any clearer. Thanks for this recipe. I love BBQ chicken and the pineapple sounds even better. I can wait to try this. Hi Kelly thank you for a really good recipe. I just made it for dinner and everyone loved it. I did drain my pineapple and I love green pepper with pineapple so I added one cut into chunks and a tsp. Minced garlic. Oh it was really yummy. We paired it with brown rice. Next time I am making spicy sweet potato wedges to go with it and serving it on Kings Hawaiian Buns. Hi DeAnna! I’m so glad you liked it! The addition of the green pepper sounds delicious. Hi Kelly, I’ve just love this recipe. I made it a couple of months ago and added some green pepper. I did drain about 1/2 the pineapple after reading the comments. We loved it. Last night I was craving some pineapple (I have no idea why), and I had all the ingredients for this…except chicken. Well I threw it in the crockpot with several 1/2 slices of cooked ham and made the recipe the same way as before. OMG it was amazing. I only cooked it on low for 4 hrs because the ham was already cooked. Thank you for the inspiration. Love all your recipes. Thanks so much, Kris! I never thought to make it with ham but that sounds delicious. I will have to try it soon. I’m making this today with skinless/boneless thighs as my husband is not a huge chicken breast fan due to dryness. Would the thighs make it greasier? If so would you recommend me draining the pineapple first? Thanks for the recipe can’t wait to try it. The thighs may make it a bit greasier. Draining the pineapple will help. How much bbq sauce do I use? I used an entire bottle. Cooked this on low heat for 8 hours as recommended, and the chicken came out insanely dry. I was a little shocked haha. Next time I might cut down on the low cooking time to 4-6 hours. This looks great- making it this week. What do you normally serve it with? I serve it with rice. Can you cook this in a pressure cooker? Hi Jerry. I’m not sure if this would work or not. I don’t have a pressure cooker and have never tried it that way. I wanted to thank you for all of your helpful comments. I am looking forward to making this for a holiday party at work, next week. HAPPY HOLIDAYS! I used a rotisserie chicken in mine and it took me less time . And turned out great. That’s a great idea, Theresa! Thanks for sharing! Would it still be 6-8 hours if you are only using two chicken breast. I just bought a 2 quart slow cooker and would love to try this it sounds so good. Instead of doing Chinese take out. Yes, still 6-8 hours on low or 3-4 hours on high. When I make my hawaiian chicken i put in half a small jar of apricot jam this brings out the sweetness and allows the chicken shine.. I used a honey bbq sauce with my Hawaiian chicken and it tasted amazing! My family absolutely loved the honey bbq sauce better than the regular bbq sauce. Can you provide the estimated weight of meat that you have used? Hi Kim! I usually use thin chicken breasts. I don’t know the exact weight. If the chicken breasts are thick, I sometimes slice them in half to make them thinner. This looks delicious! And so easy too. LOVE it. Thanks for the recipe. Thinking about making this tonight. Can you use a 2 at crock pot, and if so is the time the same. Yes you can use a smaller crock pot and the time would be the same. Making this tonight for myself, but only using 2lbs chicken breast, which is three breast would cooking time change if I’m doing it in hi temp. Cooking time is 3-4 hours on high heat. Do I need to cook the chicken before placing it in the crock pot? No, you put the chicken in raw. This looks great … we are taking our RV out soon, and I am always looking for easy crock-pot recipes and this looks perfect. Can’t wait to try it. Thank you! I’m making it for dinner tonight and being 9 months pregnant and being half asleep I forgot to cut the chicken breast in half as they were pretty quick how much longer do you think it will take to cook maybe as n additional hour or two on high?? It will be fine for 3-4 hours on high. I’ve used all sizes and thicknesses of chicken breast and they have all turned out good in the 3-4 hour range. Hi Debra! Yes, the cooking time would still be the same. I was hesitant to try this because hey, what recipe that calls for only 3 ingredients is actually good? I was also leery because of the people who said theirs was soupy. So I took a leap of faith and it was good! I seasoned my chicken with some random spices, added some diced up yellow pepper, and followed the rest to a T (drained the pineapple really well) and cooked on low for about 5 hours and it was done (glad I checked it before or it would have been dry) and it was NOT soupy at all – I had a thick, sticky sauce. We will keep this to have again for sure! Thanks! Thanks so much for stopping by, Hollis! I’m happy that you liked the recipe. The addition of the bell peppers sounds delicious!